The sign of a successful sims-pansion is that the new content enriches the experience without obstruction other content. Everyone’s threshold of “enrichment” is different—Alpha, for example, hates being asked to travel to China—but clearly it’s important to be able to carry on previous favorite hobbies while taking on new hobbies or new professions. 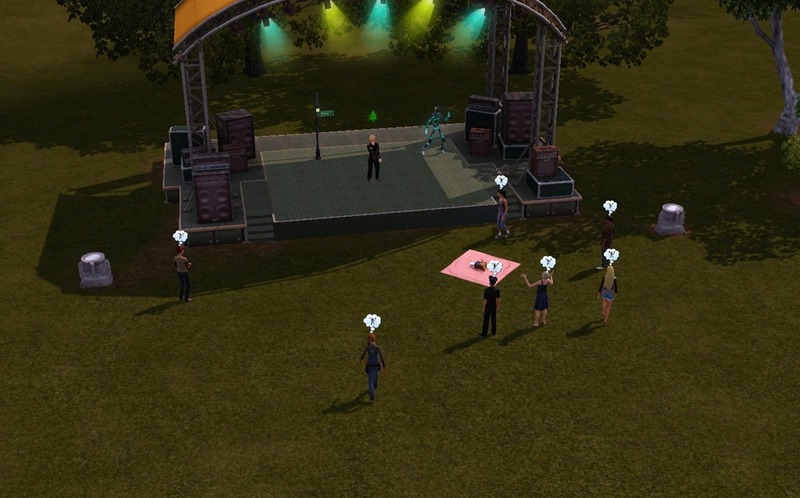 Flaw:The profession jobs, such as the Sing-a-gram, expire fast as compared to other profession jobs in Sims 3, causing your sim to lose a lot of them. Feature: Live performances rather than pop-up menus with text. Flaw: To not do poorly, the player must micro-manage the performance, which is time consuming and problematic in households. Flaw: Your sim is terrible at karaoke, and yes, you must listen to him try. Despite these shortcomings, let’s look at the big picture. Showtime is the Sims 3 reincarnation of the Superstar sims-pansion for the original Sims. Superstar had one over-arching problem that was common among Sims 1 off-lot experiences: an all-too-predictable mood drain smack dab in the middle of the most crucial moment possible. For Hot Date, this was usually dessert; for Making Magic, this was negotiating for spells; and for Superstar, this was shooting a music video. All of these activities were failures. Dessert should never be a failure. Dessert is a win. With this in mind, I figure that for Showtime, a victory is maintaining my sim’s mood through the performance. Given the inherent freedom of Sims 3, this is a simple task. So, though the expansion does not add greatly to the Sims 3 experience, it takes an unsuccessful concept from its predecessor and makes it work.